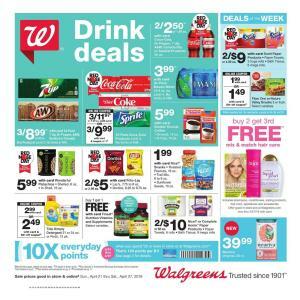 Browse the currently valid Walgreens Ad and scan previews of the next 2 weeks. Rewards are waiting for you in the latest Walgreens Weekly Ad Pharmacy sale. Firstly, you might wanna check pg 12. Rewards for a certain amount of purchases, online coupons, BOGO deals, and price drops are in the pharmacy selection of the ad. Lower prices of allergy and pain relievers are on pg 15. You'll be able to buy Zyrtec Allergy relief, Claritin, Emergen-C, Mucinex, Aleve, and more on pg 12. A mix and match sale can help you with savings. Buy Glucosamine, Omeprazole, Nicotine mini lozenge, Isopropyl alcohol, and more, which are BOGO 50% off sale. Get your prescriptions at Walgreens. Also, find feminine care and nutritional shakes on pg 17. Ensure original or clear protein will cost only $7.99! You can find products like always discreet, Poise or Depend with BOGO deals on pg 17. Find deals on Walgreens photo services such as wood panels, 4x6 prints, canvas prints & custom floating frames. Walgreens personal care products like Gillette products are on pg 12. Buy dental care items, too. Earn $5 rewards when you spend $10 or more on participating products like Crest or Oral-B toothpaste, toothbrushes, mouthwash, and more. More coupon savings are possible to spot on this Walgreens Ad Preview. 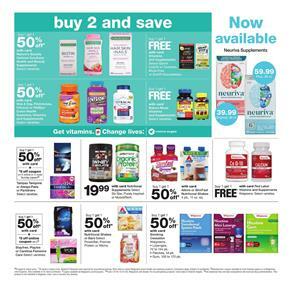 More products and deals from the pharmacy range of the Walgreens Ad Apr 21 - 27. In the beauty section of the latest Walgreens Ad, you'll be able to find a lot of products that will be a rewarded purchase. The deals are effective starting on Sunday. 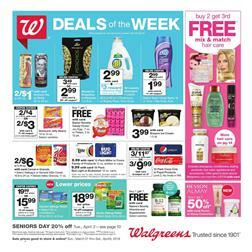 Browse the personal care range of Walgreens Weekly Ad on pg 19. Dental care, disposable razors, gift sets, baby care, and more are rewarded products. For example, earn $5 reward when you spend $25 on baby care items. Johnson's, Pedialyte, gripe water, and more are participating items. Earn rewards for buying Listerine mouthwash, Bic Disposable razors, and many more products in the personal care aisle. Moreover, you have online coupon savings on some products. Check out the discounts on fragrances, too. For example, save $10 off regular prices of Designer Fragrances. 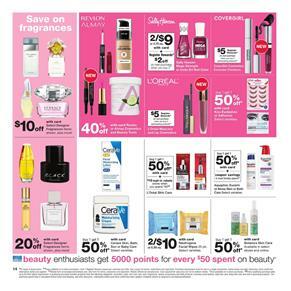 L'Oreal Paris mascara and lip cosmetics will be a $5 register rewards. BOGOs are available in the latest Ad. Buy 2 hair care products to get 3rd free! Save with the $15 mail-in rebate when you spend $50. Buy smoking cessation products like Nicoderm CQ patches, Nicorette gum, Lozenges, and more that will cost only $41.99! See the reward items on below the list, check out the Walgreens Easter sale and continue shopping while saving more. Check out the mail-in rebate deals and more register rewards. Coupon savings are available on pg 22. Celebrate with Easter bunnies or Eggs at Walgreens. Plenty of Easter products are available in the latest Walgreens Ad. Although it's a product range expected to be a drugstore range, Walgreens Ad has a fantastic snack-beverage-candy sale for Easter holidays. Enjoy with your whole family, spend less on everything. Walgreens store picks the deals of the week on the preview of this ad. They are Purex laundry care, Snickers, M&M's, Arizona Tea. Walgreens Coupons are also great savings. Plus, you have mail-in rebates on certain items. Save with rewards, too. Colgate Toothpaste optic white or total advanced will cost $1.99 with $2 off coupon and you will get $4 reward when you buy 2. Shop Easter deals on household or grocery deals. Breakfast foods like Kellogg's cereal, Pop-Tarts, Froot Loops will cost 2/$5! Walgreens coupon will make Coffee-Mate creamer only 2/$3! 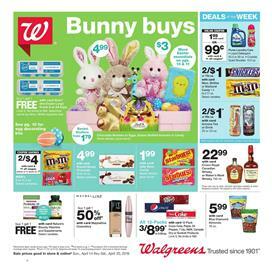 Walgreens Easter treats including chocolate bunnies, Easter eggs, candies, and popular snacks are available on pg 5-6. Shop for the pharmacy needs on the last part of the ad. These are the preview of the deals that start to be effective on Sunday. Subscribe to Walgreens Weekly Ad for all savings in the future and get emails. Easter baskets, online coupons, and BOGO Free items are in the range of grocery-snacks of the Walgreens Ad Preview. The deals are effective starting on Sunday. Toys are popular and great gifts for Easter. Easter baskets, egga, grass, stuffed animals, and more have a starting price of $.99! Also, discover the treats like Hershey's candy products including Reese's and KitKat. You can save with coupons, too. M&M's will cost $1 cheaper with coupon saving. 2 of them will cost only $4 after this discount. Walgreens also has BOGO deals on Nature Made, Nature's Finest vitamins, and more in the health-care section of the Ad. Buy Easter treats to enrich your breakfast mornings. Kellogg's frosted flakes, Rice Krispies, Froot Loops are your breakfast foods on Walgreens Ad Preview. Buy Kraft Jet-puffed marshmallows for only $1.29. Easter deals are also in the form of coupons. 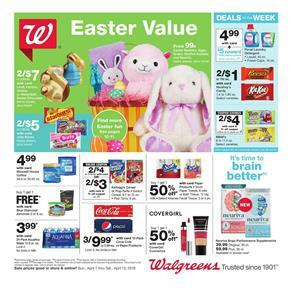 Find all Walgreens Easter sale items in the currently browsable Ad. The core of the Easter treats is on pg 13-14. The core of the Easter sale is on pg 13-14. BOGO Free toys, Easter candies of Hershey's, KitKat, Russell Stover and Easter baskets are available in this part of the Walgreens Ad Preview. An extensive beauty sale of top brands like Revlon, Almay, Maybelline, L'Oreal, Olay, Dove, and more is the products on pg 15-16. See health-care, personal care, allergy and pain relievers, nutrition shakes, feminine care, and more in the last part of the Walgreens Ad. A new Walgreens Ad Preview has been published today. Dozens of deals like online coupons, register rewards, BOGOs, and more are available in the ad. Healthy snacks are delicious and harmless. Wonderful Pistachios or Almonds will be only $2.99 with an online coupon. Most customers prefer Breyers ice cream and its price is gonna be only $3.99 at Walgreens next week. If you need allergy relievers, you might want to see Walgreens low prices for Claritin and Zyrtec. Use the BOGOs to save on personal care products. L'Oreal, Pantene, Aveeno, and more brands with their high-quality products are Buy 2 Get 3rd Free deal this week. In summer, at the times you will feel thirsty, you might look for a quick quench. One of them is Arizona Tea and you can buy 2 of it for $1. Browse the Walgreens Ad for snacks. Mars, Dove, Skittles or Starburst candy will cost $.69! You may find alternative breakfast snacks, too. High fiber and protein are the perfect choices of food for breakfast. Fiber One or Nature Valley Snacks will cost $5 for 2. Find quick food items like frozen dinner meals. Lean Cuisine and more brands are 2 for $5. Browse the entire product range of Walgreens Ad to see other deals. Subscribe to the newsletter to get news about future deals.